IFSW fully endorses the initiative of the British Association of Social Workers to highlight the serious consequences of austerity in the UK and internationally. 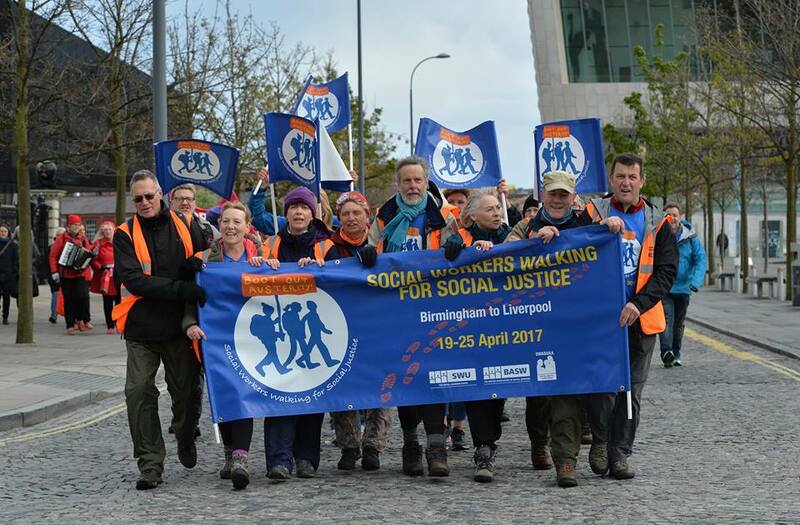 A march organised by BASW Chairperson, Guy Shennan involved walking 100 miles from Birmingham to Liverpool arriving at the BASW AGM and Conference. The march was launched by IFSW President Ruth Stark, while the IFSW Human Rights Commissioner marched with the group the entire distance. On the way, the marchers visited community centres, churches and food banks that are responding to the harsh realities of austerity. Significant leaders in the UK supported the march including Labour leader Jeremy Corbyn and the film maker Ken Loach who recently made the film ‘I, Daniel Blake’. At the BASW AGM at the end of the march delegates voted to support the IFSW policy paper The Role of Social Work in Social Protection Systems as a basis to counter Government austerity. 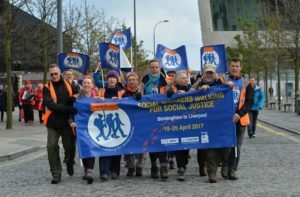 IFSW Secretary-General Rory Truell’s article: Why social workers are marching 100 miles in protest against austerity, and the BASW Website.